Meet the Pops: Flag Day Every Day is a children’s story by Belinda Barbieri. Lolly Pop lives on a special farm with Cherry, his wife, a son named Soda, and daughter, Coco. The Pops grow candy corn, lollipop trees, raise strawberry and chocolate milking cows, and cotton-candy sheep. One day while harvesting red, white, and blue lollipops for Flag Day, Soda decides to have a celebration for the flag’s birthday. The flag represents love, support of the country, and courage for those who made sacrifices. Their friends are invited, but Lolly notices that the harvested blue lollipops are missing. Who could have taken the sweets that were to be distributed on Flag Day? Will it ruin this special day? What an adorable story for kids who are in kindergarten to 3rd grade. It’s wittily written with the main characters having fun names like Lolly and Coco Pops, and animals who produce flavoured milk and other sweet treats. Belinda Barbieri made the history of the American Flag Day really interesting for children, and the story itself is amusing. One of her story’s dedications is to children who have brave military parents. Some of the things I pay close attention to when reading are the illustrations and I think these are lovely. 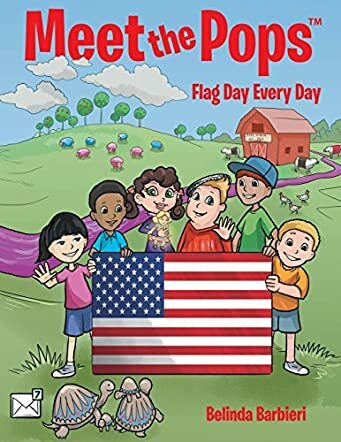 Meet the Pops: Flag Day Every Day is a delightful, educational children’s story by Belinda Barbieri. It also teaches children about taking pride in their country and respecting war veterans who have served to protect them. This book is recommended reading for both schools and homes.